Bought a set of crash bars for my 1984 K100RS. Has anyone ever mounted these on a K100? When I hold them up to the engine then they seem to fit perfectly. When I look at the parts catalogue then I see a whole bunch of parts that I seem to need on order to install these. But I don't think I need all of them. I think I only need the rubber blocks and the engine bolts. these bars also look different then the those in the catalogue. As far as i can tell these are a lot better construction wise. the connection points to the oil pan seem to line up nicely. If I want I can bolt them straight to the engine but I think I always need to fit the rubber mounting blocks. BMW's idea of crashbars was never very good. If you bolt them directly to the sump and have a crash, the sump will be shattered by the impact forces. To overcome this, BMW started fitting the rubber mounts. Good idea...? Not really. The rubber mounts sheer off and the bike hits the ground anyway. I got lucky; when I came off a couple of years back the rubber mounts sheered but the crashbar folded around the engine and protected it anyway. Part numbers ACK03079, ACK03080 and ACK03068. The mounting plate is itself rubber mounted and I've seen a couple start to come unbonded. A very crude but effective repair is a big dollop of superglue and an M5 bolt drilled right through. @Dai wrote: BMW's idea of crashbars was never very good. If you bolt them directly to the sump and have a crash, the sump will be shattered by the impact forces. To overcome this, BMW started fitting the rubber mounts. Good idea...? Not really. The rubber mounts sheer off and the bike hits the ground anyway. I got lucky; when I came off a couple of years back the rubber mounts sheered but the crashbar folded around the engine and protected it anyway. They're not "crash" bars. They're "engine protection" bars. They do a decent job of protecting things in the event of a tipover or crash at parking lot speeds. Would you want drag around the weight required to make the sump structurally resilient? 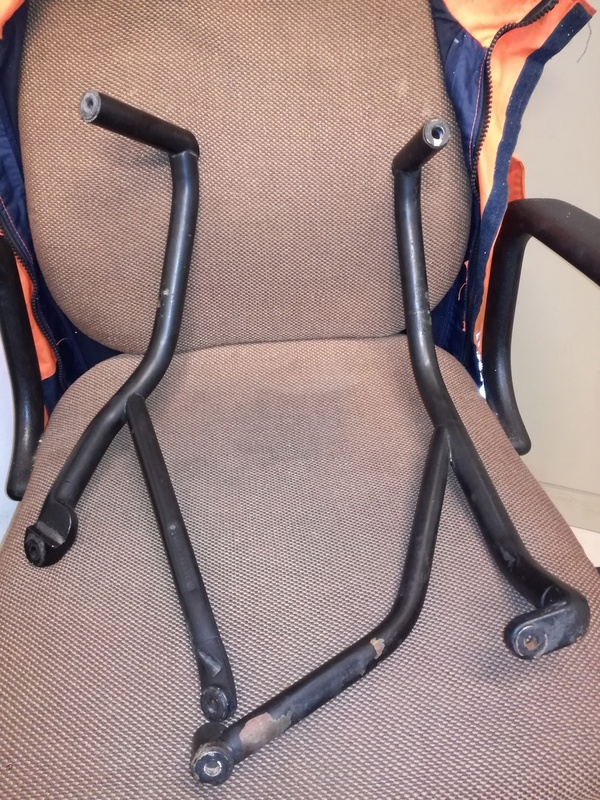 This is the very first generation of crash bars, no rubber mounts is used. screws for the sump and the upper mountings. @Inge K. wrote: This is the very first generation of crash bars, no rubber mounts is used. thanks Inge, just the info I needed. Be aware that when they break away on a bike with a fairing(RT,LT) they tear large holes in the fairing. Beyond worthless in my not so humble opinion. I have had the opportunity to drop my RT with and without "Engine Protection Bars". By far, the damage without them was less and more easily repaired. Check the price on those breakaway mounts. Add that to the damage of the drop the bars didn't prevent. Crazy! Thanks Inge - I completely failed to spot that. @Point-Seven-five wrote: Be aware that when they break away on a bike with a fairing(RT,LT) they tear large holes in the fairing. Beyond worthless in my not so humble opinion. My RS has no fairing as it has been converted to cafe racer so that is not an issue. I just like to look on the naked RS. I'll fit rubber mounting blocks myself just to be "more" safe. I second that. I had the bike fallen to the right and had just the lower fairing's lower edge broken and some minor scatches on the top fairing's edge. My friend and previous owner had the same fall and the engine bar ripped the lower fairing to pieces and significant more damage to the upper fairing part guess due to leverage. Also the mounting threaded hole on the lower engine broken, now its a half circle and cannot screw the spacer. I really think its a poor design. @George_Pap wrote: I really think its a poor design. Meh. It's an OK design. I've given my K1100LT a few inadvertent naps (stationary) and aside from mirror scratches they've protected the bike. What I like about them is they're a great place to mount the fold-up highway pegs once made by Dave Swisher (a BMW 1.7 million miler who used to ride K1100LTs.) They look stock since they use BMW peg rubber and are handy to have on long rides.